No, this is not an official new release by local screamo hopefuls Eternal Tango, but a first sign of life after their split-CD with the now defunct Spyglass. 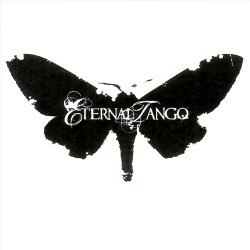 I always felt a bit sorry for the band because most people always only seemed to celebrate Spyglass, whereas Eternal Tango offered already two years ago splendid emotional metalcore that back then only suffered from a lack of focus, which was displayed on long and useless intros and outros. Back on track with new singer David Moreia, Eternal Tango recorded three songs in their rehearsal room and had them slightly mastered in Germany to make the waiting period for their first full length album shorter. While the sound lacks the transparency of a professional recording, it already promises a full-fledged surprise for the end of the year. Their songs have become much shorter, and combine effortlessly melodic emo and aggressive screamo elements which possibly may not be a novelty by itself, but it's been done in a way unlike any other band in Luxembourg has succeeded. The melodies have real depth, the new singer has a snotty attitude, and the rhythm section takes care to keep the songs from turning too soft. If Victory Records are looking for their first band to sign in Luxembourg, they shall seek no longer: Eternal Tango have the talent and ambition to play with the big boys. And as this is only a foretaste of what's to come later this year, you have the opportunity to download these songs for free on the band's homepage. You'd be a fool not to seize this chance. We even forgive them for writing the following sentence in their press book: "...everything is possible unless you work hard enough for it...". Either Eternal Tango believe that something comes out of nothing, or their English teachers need to teach them about the use and meaning of prepositions. Ehü!